The bottom line to the right left (I hated to look on the right) gives a prime example, notice the O(oh) out front is different from the 0 (zero) and the Z is different from the 2. This is also true with 1 and l among the various other font faux pas. It is critical to development to be able to tell what is what and that is one reason I like OCR A Extended. 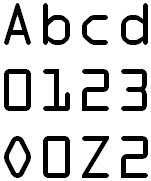 I would not want to read a novel in it but when coding I find this font to be a step above the rest. The look also has that classic computer tech look so that you know you are working on code not Gigi's Wedding invitations. Which is obviously not great for reading code! I think I will make a poll, even though my blog still lays undiscovered like a cautious lion ready to strike ... Where was I? Anyway comment if you agree or disagree. Ciao!